Lemon Square Power Pops! : Healthy and Delicious Snack Time Buddy. My kids love eating snacks and so do I. We always make sure to stock up on snacks- the food we get to enjoy in between our meals. Some people (wrongly) think snacking isn’t healthy, but we don’t agree. It is just about picking the right snacks. Snacking is a way to combat hunger between meals, sneak in some extra energy, vitamins and nutrients and even try exciting fun and delicious foods! 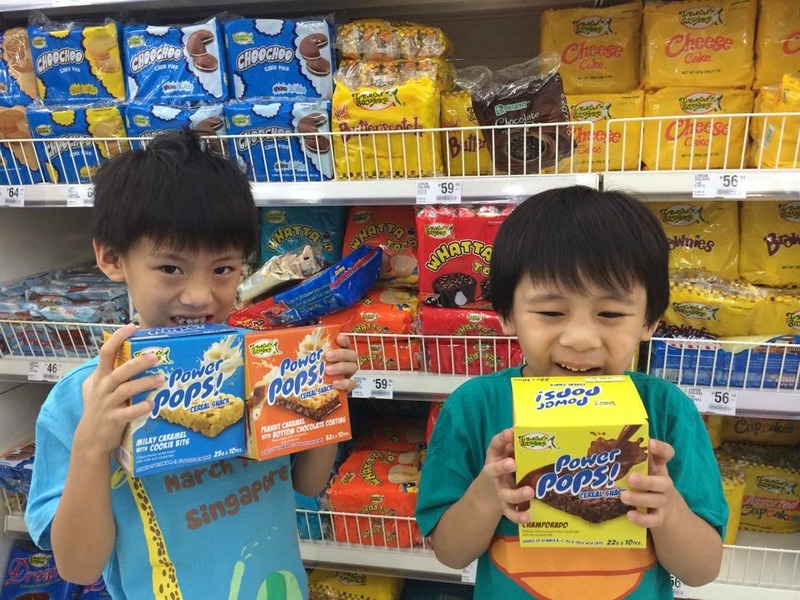 Last week, we went grocery shopping and while looking at the grocery aisle and putting our favorite Lemon Square products (Lemon Square products have also been my kid's favorite as baon for school) in our shopping cart, we saw this interesting Power Pops! goodness in healthy, delicious, chewy taste in a form of cereal bar snack and with no artificial preservatives. We will definitely enjoy this healthy and delicious snack that has vitamins and minerals that are packed with vitamins A which is good for eyesight, C to strengthen immune system, B2 to give a boost of energy, and folic acid (B9) to boost brain power. 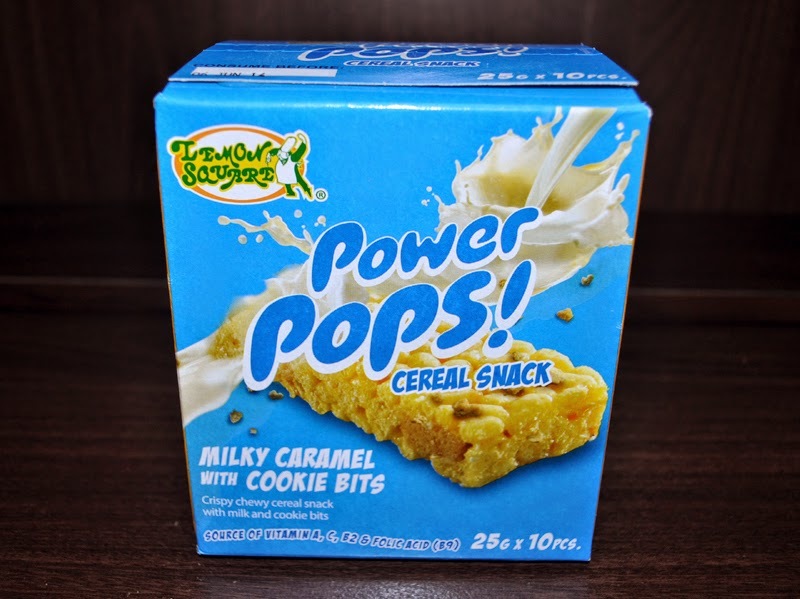 Lemon Square Power Pops cereal snack bar is made from rice crispies and is available in three yummy flavors: Milky Caramel with Cookie Bits, Champorado and Peanut Caramel with Bottom Chocolate Coating. Milky Caramel with Cookie Bits really took this to a whole new level of greatness! Niko liked this best because it tastes like cookies and cream. Champorado is one of the most delectable treats I have ever eaten. A total crowd pleaser. It is almost like the real champorado, but only in a cereal snack bar form. The additional chocolate takes this treat over the top, and boy, it is that satisfying! This is Ethan's most favorite and everyone could not get enough of it. Peanut Caramel with Bottom Chocolate Coating is a Chocolate, caramel and peanut butter in a crispy, chewy treat that is going to be added to my list of favorites! You're going to want to try these soon. Elijah and I like this best! I really love how many amazingly delicious variations there were able to think of. I heard that they will be adding more exciting and enticing flavors soon! Going outdoors, swimming, enjoying road trips, picnics and BBQ's with family and friends or simply relaxing at home is always one of the highlights of my summer and organizing these mom-approved snacks that we can bring with us anytime, anywhere helps kids keep up by fueling their bodies with the good vitamins and energy they need. 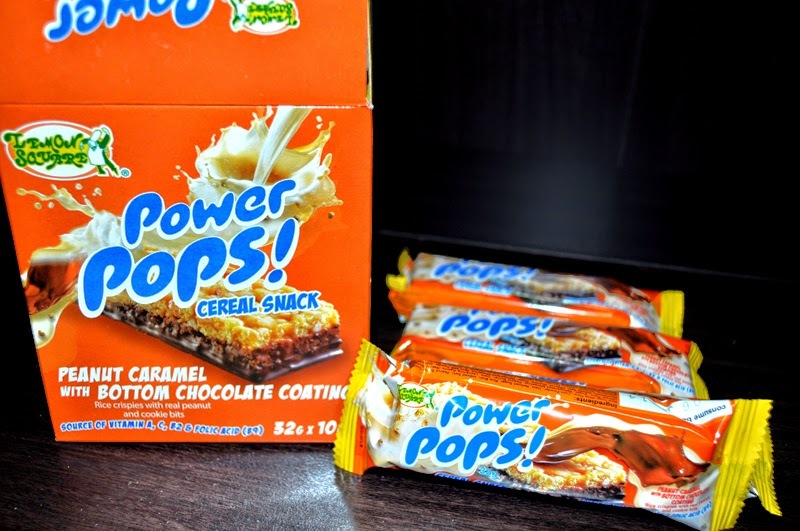 Whatever fun-filled activities we do with kids this summer, Power Pops! is here to be our snack time buddy. Lemon Square Power Pops is as nutritious as it is affordable priced of only about Php60 per box and has 10 pcs. It is available in leading stores and supermarkets nationwide. Make Power Pops your snack time buddy this summer! They are healthy, affordable and kids absolutely LOVE them (so do adults). To celebrate the upcoming Mother’s Day, Lemon Square Power Pops launched the Power Shop for Power Pops Moms promo. It’s an online contest with the easiest mechanics! It’s a simple sharing of your best photo with your loving moms on your Facebook timelines answering the question, Why do you love your mom?. ♥ Upload your best photo with your mom on your timeline and state reasons why you love her as the caption. Tag @Powerpops FB page and include the hashtag #PowerShopForPowerPopsMoms to be considered an official entry. ♥ Prizes: Three winners will be selected to get a hold of Sodexo gift certificates plus gift packs from Power Pops. ♥ Consolation prizes in a form of gift packs will be given to 5 other participants. Entries will be judged according to the following criteria: photo creativity and presentation (50%), “Why I love my mom” statement originality (40%) and Power Pops judges’ personal choice (10%). Winners of the promo will be announced via Powerpops FB page on May 12, 2014. Champorado flavor is my favorite, bata pa lang kasi ako hilig ko na ang champorado lalo na pag umuulan,. 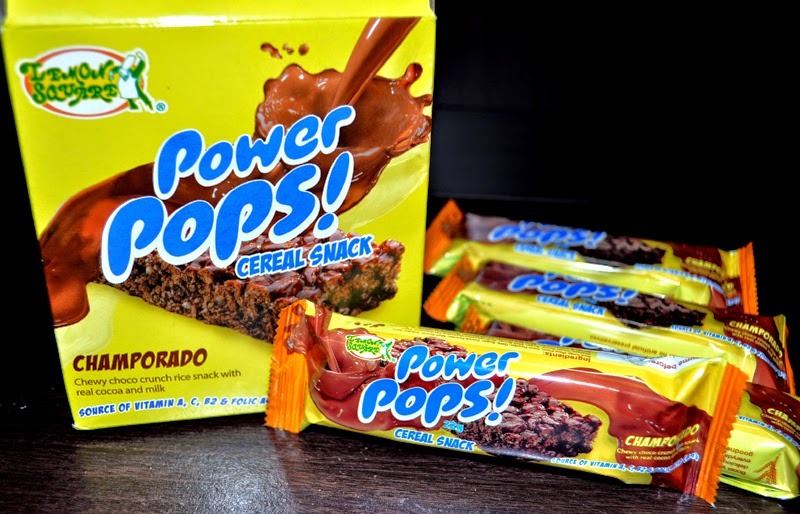 sumali na ko sa promos ng Power Pops, hoping na manalo,. My sister love the Champorado flavor but I prefer the peanut butter instead because I'm a peanut butter addict! From the peanut itself to the spreads to lemon pops! I super love it! 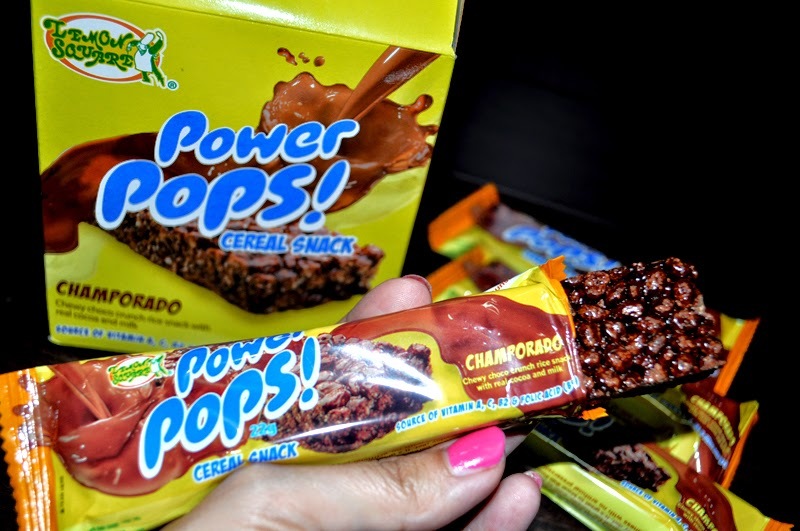 power pop is a healthy snack my kids love too,it really helps so they wont be craving for chitchirya and junk foods! I have always loved cereal snacks because it's yummy and also healthy. 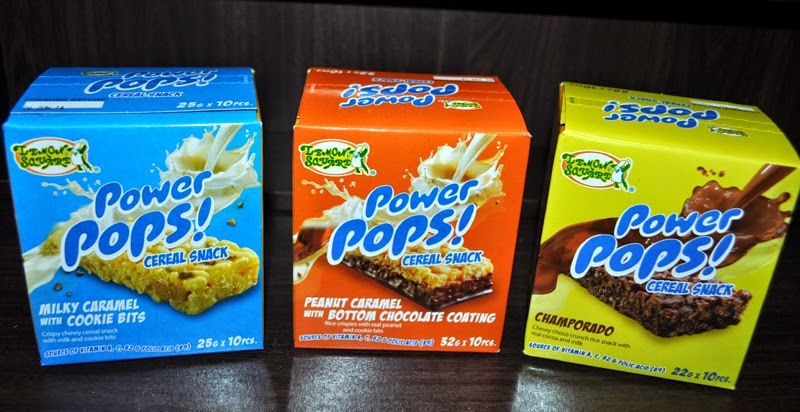 Powerpops is really a great choice for my kids' baon at school. Masarap na, masustansiya pa! Nakabili ako nito yesterday sa grocery,like ko ito pra sa mga kids ko ;) healthy! i've tried milky caramel with cookie bits. 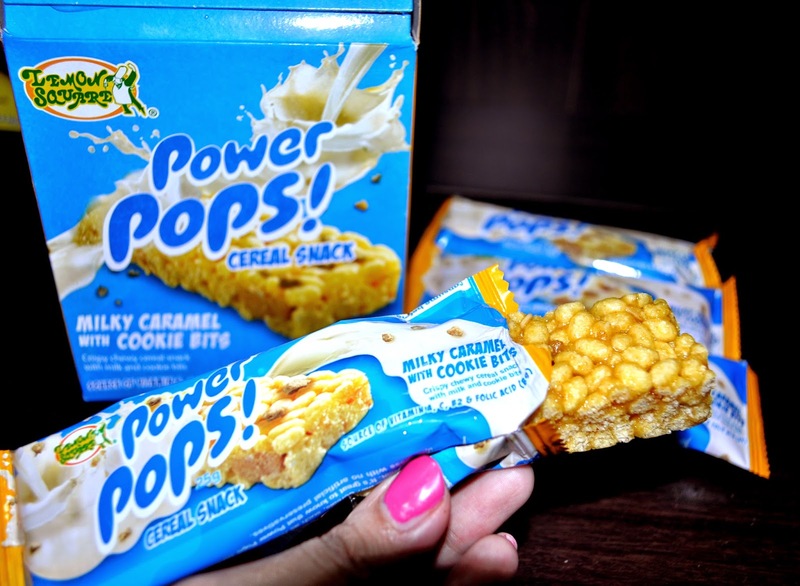 masarap sya at healthy pa.
Me and my kiddos really love the amazing delicious variations of Powepops. My eldest always bring this as her snacks in school and share to her classmates and they love it too.. 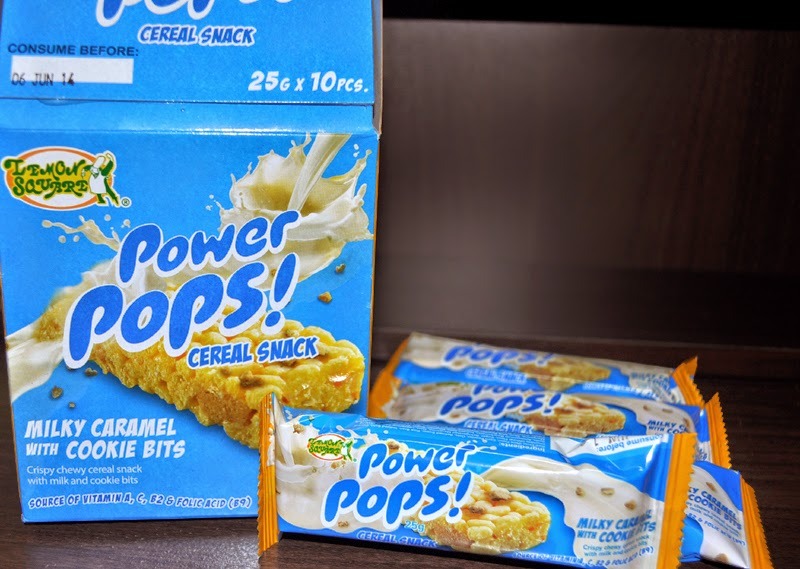 It's one of my favorite too..
my kids loves the Lemon Square cheesecake then I buy this power pops to try the taste and they also like it..
wow thats one of our ultimate favorite.. I haven't tried it yes, but I love the idea of having a snack like this, For sure, its really healthy hehe. And there's a variety of flavors , for sure di ka agad magsasawa.. I missed the contest..sayang! 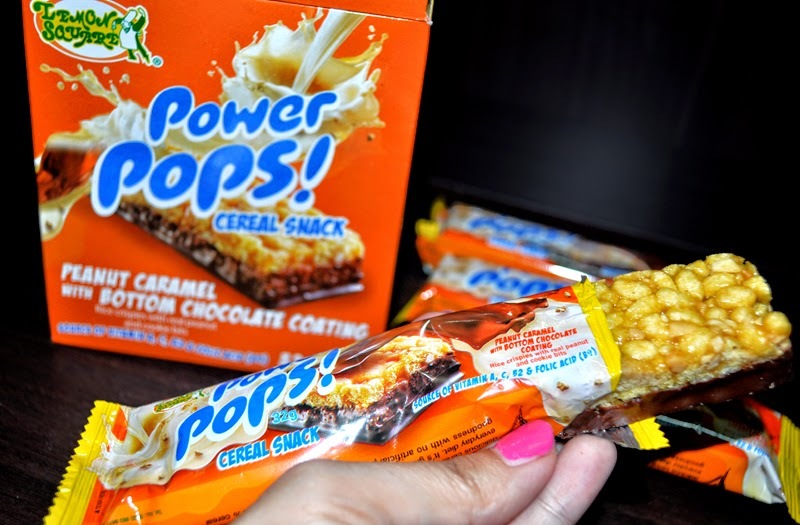 Anyway, we are a fan of Powerpops we love it as snack , sometimes dessert na din. This is new to my insight.... je,je,je... As I am far from the city, I am really late about new products. Buti na lang at may blogs na ganito. If there is a product like this here in my place I will surely buy this. My kids likes power pops and i joined the contest unfortunately i did not win , maybe next time ^^ :) . I got to try this looks delicious! kid at heart! he! he! 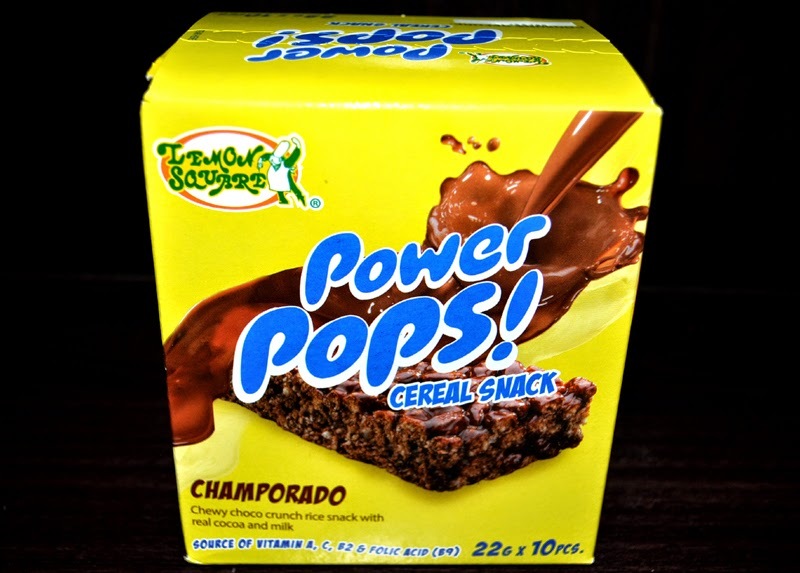 My kids love the champorado Lemon Square Power Pops Snacks... It is the best healthy snack for my kids... They always craving for it! My son like it since natikman niya. 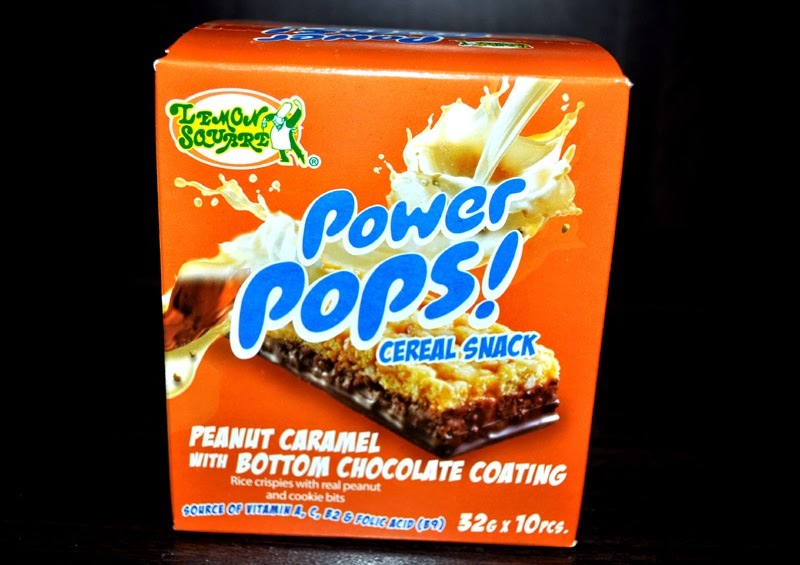 I haven't tried Power Pops yet, but it looks like a nutritious snack indeed for the kids so I might look for this in the grocery stores next time I do my grocery. I like to try this with my niece i know we will enjoy eating this. wanna try this, wala pa kz akong nakikitang ganito sa mga grocery dito sa amin,. My husband and I love this! It's not only nutritious and delicious but it's also healthy snacks for us. it's a great substitute for junk foods coz it's healthier! Wow! sarap! I want the champorado flavor! this is very yummy my sister loves this. wow!!! gusto ko tikman lahat ng flavor ng lemon square power pops.. it looks yummy!!!! gusto ko tong matikman at ipatikim sa kids ko!!! Lemon Square went to my son's school last March to promote Power Pops and he loves the champorado variant. I will definitely included this in our grocery since it is healthy and affordable too. PowerPop is a great healthy snack. This is best for our kids' baon. Good for the kids snack specially for baon. I think its nice to try and affordable as well. That's my favorite, super yummy as in! thanks for this blog i have again an idea of a snack for my kids. And iy was healthy and delicoius good fotr my kids. wow that is so delicious! 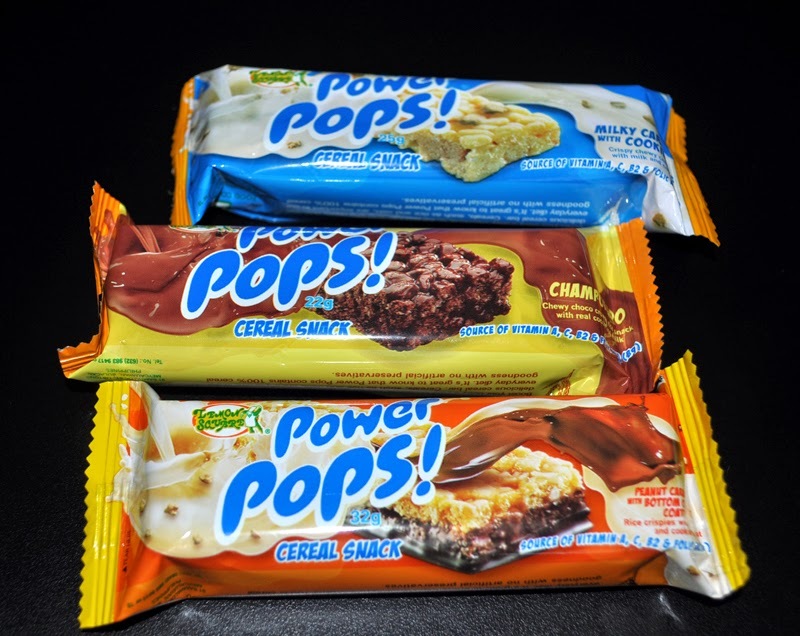 you can never go wrong with powerpops.. its very healthy pwede sa mga kids. Peanut Caramel with Bottom Chocolate Coating is my kids favorite during merienda and even while they are watching downloaded movies..Delicious and affortable. I am drawn to the Peanut Caramel with Bottom Chocolate Coating variant. I will look for it on my nest grocery trip. I hope it is not cloyingly sweet. Yum! Will share this post to my kids. Thanks for posting. My kids favorite is the Milky Caramel with Cookie Bits! healthy food for my son! Good thing you share this kind of snack. I was able to try it with my son last day & it's yummy. while im browsing and reading your post my son saw and told me to buy one for him because it looks so yummy another additional list to his baon everyday..
Haven't tasted this new product yet but I love lemon square's cheese cupcake the one Kathryn endorses!